Holiday decorations, like candles, lights and Christmas trees, add a joyous and festive mood to the holiday season. But when these decorations are not used properly, they can cause fires, injuries and death. Thus, the Consumer Product Safety Commission (CPSC) has issued safety tips for holiday decorations. *When purchasing an artificial tree, look for the label "Fire Resistant." This label only indicates the tree is more resistant to burning. *When purchasing a live tree, check for freshness. *When setting up a tree at home, place it away from fireplaces and radiators. Be sure to keep the stand filled with water. *Indoors or outside, use only lights that have been tested for safety by a recognized testing laboratory, such as UL or ETL. *Check each set of lights, new or old, for broken or cracked sockets, frayed or bare wires, or loose connections. *If using an extension cord, make sure it is rated for the intended use. *Never use electric lights on a metallic tree. *Before using lights outdoors, check labels to be sure they have been certified for outdoor use. *Stay away from power or feeder lines leading from utility poles into older homes. *Use only hooks or insulated staples (not nails or tacks) to hold strings of lights in place. *Outdoor electric lights and decorations should be plugged into circuits protected by ground-fault circuit interrupters (GFCIs) to protect against electric shock. oPortable outdoor GFCIs can be purchased where electrical supplies are sold. oGFCIs can also be installed permanently to household circuits by a qualified electrician. *Turn off all holiday lights when you go to bed or leave the house. *Use only non-combustible or flame-resistant materials to trim a tree. *Never use lighted candles on a tree or near other evergreens. oTake special care to avoid sharp or breakable decorations. oKeep trimmings with small removable parts out of the reach of children. oAvoid trimmings that resemble candy or food that may tempt a child to eat them. *To avoid eye and skin irritation, wear gloves when decorating with spun glass "angel hair." *To avoid lung irritation, follow container directions carefully while decorating with artificial snow sprays. *Do not burn wrapping paper in the fireplace. Wrappings can ignite suddenly and burn intensely, resulting in a flash fire. *Place a screen around your fireplace to prevent sparks from igniting nearby flammable materials. *Use Only Nonflammable Decorations - All decorations should be nonflammable or flame-retardant and placed away from heat vents. *Never Put Wrapping Paper in a Fireplace - It can throw off dangerous sparks and produce a chemical buildup in the home that could cause an explosion. 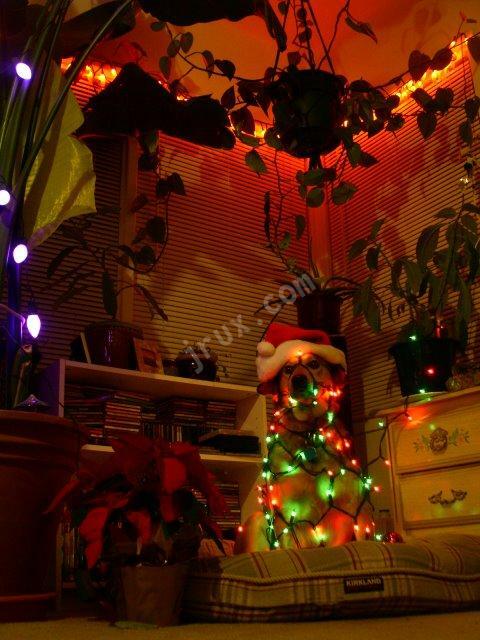 *Artificial Holiday Trees - If you are using a metallic or artificial tree, make sure it is flame retardant.